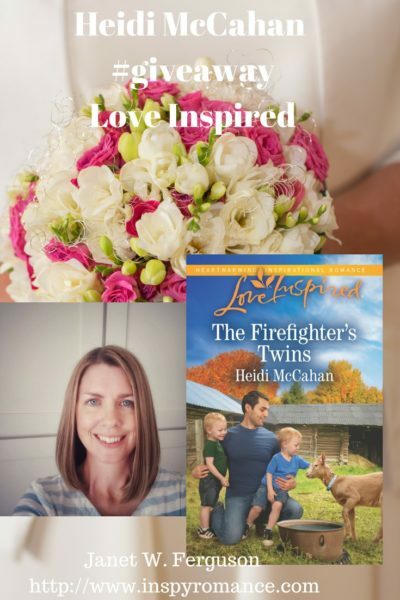 I’m excited to welcome Heidi McCahan back to tell us about her new novel with Love Inspired! When Plans Derail and Your Tiara Breaks, What’s a Girl to Do? Natalie, the heroine of my new release The Firefighter’s Twins is an event planner. Rustic barn weddings held at her family’s farm are her specialty, yet she longs to shed her dual role as event planner and family business manager (she helps run the farm that is now a destination experience with a pumpkin patch, playground, train ride, etc.) so she can focus exclusively on weddings. Enter Shay, the hero, a firefighter and single dad of twin toddler boys who is still reeling because his life isn’t going quite how he’d planned, either. Because it is prime wedding season here in the United States, and my novel is about a professional event planner, I was thinking about how weddings are a classic example of how we long for our plans to be executed in a flawless manner, yet we all have a story or have chuckled at an online video featuring a blooper or unforeseen mishap. Allow me to share mine: I chose to get married in my husband’s hometown because he has a large extended family living close by that loved to attend family weddings. I had moved far away from my own hometown and had always lived far from my extended family, so logistically, it was easier to ask my side of the family to travel. We’d planned a low-key afternoon wedding, anyway, and did not expect a huge turnout. Fast-forward to the evening before, when the rehearsal dinner is over, and I just want to retreat to my hotel room with my parents and relax. Well, that was not what everyone else wanted. Our two-bedroom suite became a revolving door of visitors. I was almost in tears, because I’m an introvert and I needed a minute, you know? I cope by micromanaging, so I started messing with the headpiece that was meant to attach my veil to my hair. It was a tiara (of course! ), and somehow I managed to break the top off, which in my frazzled-bride-to-be state was the end of the world. Meanwhile, the socializing continues in the next room, and I’m about to lose it. My dear sister, who has traveled across the country with her husband and three small children to be a part of the celebration, is in the midst of potty-training her son. Nature calls and he declares this the moment to take care of business. In his sheer delight at achieving success in the bathroom, he wants to share his news with all who’ve gathered nearby. He jumps off the toilet and races past my wedding dress, carefully arranged on a hanger with its glorious train spread out on the floor …right next to the bathroom door. Have you ever seen the facial expression of a bride who has just realized there is poo on her wedding dress? Thankfully, this was 2002, and we hadn’t quite figured out how to document our lives with our phones, otherwise this moment might’ve gone viral had there been social media available. There aren’t any photos of this moment, which is probably for the best. I don’t know how I managed to control my reaction, because I wasn’t a mom and had no idea how challenging potty-training can be, but a tiny voice of reason told me not to crush my nephew with my words. I just remember thinking that if I yell and scream at him, he probably won’t ever use the bathroom appropriately again, because he will be so humiliated. It isn’t often in life that I hold my tongue, but I am proud that I was able to do so in the moment. Sometimes the Lord in His infinite wisdom can whisper truth to us even when our tiaras are broken and there is an unexpected mess at our feet, right? Bless my aunt who swooped in with a hot glue gun and finagled that dewdrop shaped faux diamond back into its rightful place on my tiara, and used a plastic hotel keycard to scrape the offensive material from the embroidered flowers on the train of my wedding dress. My bridesmaids took me out to Applebee’s so I could relax, my nephew grew up to be a delightful young man, and Steve and I remain happily married. If your life is not going according to your plans, I hope at some point you can step back and take a breath and try to see the humor. Ultimately I hope that you can lean into God’s promises that He is good, He is for you, and His plans never go off the rails. Heidi McCahan is the author of Covering Home, Unraveled, and Love Flies In. 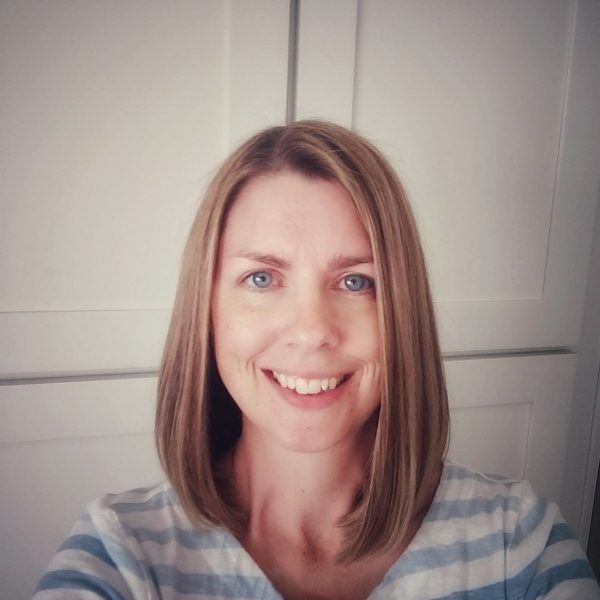 She is also an active RWA and ACFW member, grand prize winner of the 2014 Idahope contest, and a 2015 finalist in Harlequin’s Blurb 2 Book contest. A Pacific Northwest girl at heart, she was transplanted in the South several years ago, and currently lives in North Carolina with her husband and three boys. Heidi is a huge fan of coffee, dark chocolate, and happily ever after, and can often be found enjoying a good cup of coffee and a great book. 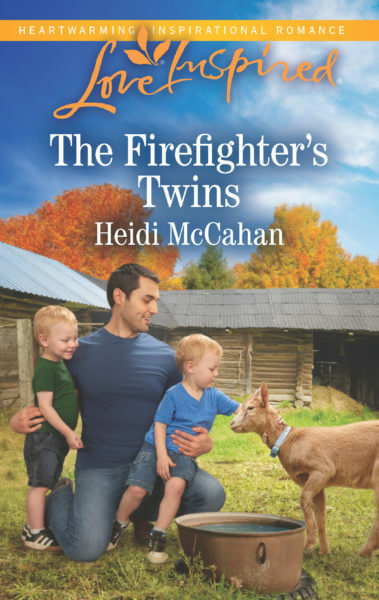 The Firefighter’s Twins, her first novel with Harlequin Love Inspired, releases in June 2018. Thank you, Heidi! This is a sweet story! I know our readers will enjoy! Thanks for stopping by. Unexpected wedding day glitches make the best stories, right? I’m glad you are still a happy family. Hi Janet and welcome back Heidi- I’m re-reading Covering Home at the moment:) Wow, what a pre-wedding time you had! The drama and chaos would definitely have had me in tears too!! Hmm, moving to Melbourne was definitely NOT in our plans, but looking back, God has worked it out to be a very good thing for us. Hi Wemble! So cool that you are rereading Heidi’s novel! I loved the setting in that one! Your Melbourne story sounds interesting for a novel. Thanks for re-reading Covering Home. That was a fun one to write, especially the parts about Japan. Wow, moving to Melbourne definitely sounds like a plot twist. Our God is good and always faithful, isn’t He? Hi Janet and welcome Heidi! Thanks for sharing your wedding story. Most of my wedding hiccups happened months before the wedding – changing the wedding date due to caterer availability and finding an organ for the church. Then the day before the wedding my mom had my dad and brother in tears. I was becoming impatient with her meddling. The evening of the wedding we had a summer thunderstorm. Just as the pastor finished his opening prayer and said Amen, God answered with a loud clap of thunder, as if God blessed the Union. Hubby and I will be celebrating our 45th wedding anniversary on June 16. An interesting fact is that my maternal grandmother also got married on June 16, 1919. Heidi, your new book and cover are inspiring. Best wishes. Hi Renate! So happy for you! 45 years is an accomplishment! Hi, Renate. So nice to ‘see’ you here. Happy Anniversary! That’s wonderful. Thank you for the compliments on my new book. Blessings! I think it’s very true that things turn out better than expected. It’s always cool to see how God works things out! So true, Ellie! Thank you for taking the time to comment. What a wonderful cover, story sounds good too. Hi Heidi (again)! Just added Covering home to my wish list, since Japan caught my interest. In 2008 spent three weeks in Japan on. A Fulbright teacher exchange. As a retired World Language teacher, I enjoy reading books with international settings. Book sounds delightful. Thanks, Renate! I hope you enjoy reading Caleb and Britt’s story. When I was in high school, budget issues caused my dad to lose his job. He and my mom decided to use that as an opportunity for us to leave California and move closer to my dad’s side of the family. We ended up moving to Kentucky. To my 9th grade brain this seemed like the worst thing ever. Looking back I can see how God orchestrated the whole situation and brought so much good from it. I can’t imagine ever having gone to college in Tennessee if we had stayed in California. That college decision led me to taking my first post college job in Virginia, which is where I eventually med and married my husband. Beautiful story, Melynda. Thank you for sharing! Sweet! Glad it worked out! He is good! I really needed this today Thank you for sharing! You’re welcome, Kimberly. Thank you for reading my post. Hi Kimberly! Sending virtual hugs! So sorry, Shannon! That’s not a happy ending. Hugs! Oh, no! I’m sorry you weren’t able to attend your nephew’s wedding, Shannon. Thanks for reading this post and taking the time to comment. Blessings! I’ve seen lots of pictures though. And we’re planning to get together to watch the DVR soon. The important part is that they’re married and everything went off without a hitch. Hi Shelia! Glad you can laugh now! That’s definitely a wedding to remember, isn’t it? Thank you for sharing. Great to have you back to Inspy Romance for a visit, Heidi! What a story about your wedding! I’m looking forward to reading your debut Love Inspired. Thanks, Valerie! It’s fun to be back visiting with all of you. My wedding day story starts at 8 AM as we got to the church. My maid of honor came out and told me my dress was ripped! I went inside to discover a layer of tulle hanging to the floor! Vandals had broken into the church overnight! Theya ripped my dress, stashed a bridesmaids dress under the sink, ripped up the soloist sheet music, and dumped sugar in the bottom of the refrigerator! God is good!! My dress was fixed and no one could tell that I had even been ripped. Although it was the topic of conversation as we visited people during the reception. It will be 22 years this summer and we’re still happily married. We can share the story with smiles and remember God’s goodness and provision that day! Hey, Jennilyn! Jennilyn is my cousin, by the way. 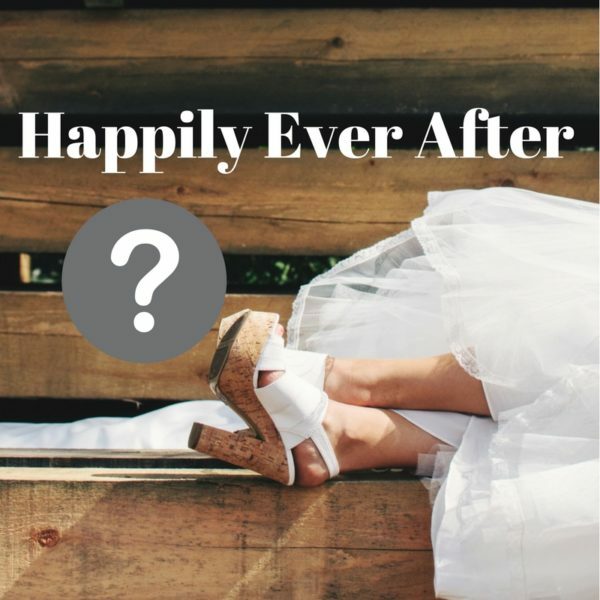 Thanks for visiting Inspy Romance today, and sharing your wedding day story. Far more traumatic than my silly tiara and temporarily soiled dress. I’m so glad you moved forward with your plans that day. God is good, all the time. Wow, I’m glad you were able to see the real issue of not mentally messing up your nephew! I’m not so sure I would have caught that!! But, my mother had the foresight and wisdom to be preparing me since the day I got engaged that all weddings have mishaps and mistakes. We actually were looking forward to seeing what all would go wrong, just to be able to laugh about something! The morning of my wedding the car had a flat tire so we had to put everything into a truck and get to the church that way. Then an usher’s suit vest wasn’t at the store, I was so nervous I was about to throw up so we had hands full of mints up front, then the flower girl fell off her rocker during prayer (try to not giggle about that while in prayer, lol). I am a laid back introvert, so I just wanted to get done and didn’t care how it happened. Such fun memories!! Oh wow! You did have some unexpected incidents! Glad you’re laid back and can laugh about it! I’m reading these and grinning because as the erstwhile wedding co-ordinator at my mega church for a season I am struck with the reality that I was probably as often the cause of wedding surprises as I was the solution! I take great comfort in the fact that many remain happily married so the ends justify the means?? ?